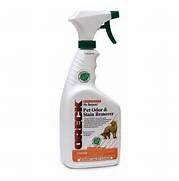 Helps clean pet stains and odors. No Return® Spot Remover for Localized Stains helps clean stains. It penetrates the stain and odor to dissolve it. No Return® is actually two products in one and specially designed for pet problems. Its special blend of cleaning agents and enzymes cleans stains caused by urine, feces, vomit, blood, food, perspiration and other organic stains. Use on carpets, floors, furniture, clothing, automobile interiors, litter boxes, cages and pet living and sleeping areas. Just spray and let dry.